In testimony before Congress’s Joint Economic Committee today, Treasury Assistant Secretary Alan Krueger provides further evidence that small employers have been particularly hard hit by the financial crisis and economic downturn. [T]he improvement in the labor market seen to date has been unevenly distributed across establishments of different sizes. On the positive side, labor demand has generally trended up at large private sector establishments since reaching a trough in February 2008. Moreover, large establishments have apparently increased employment in five of the six months since September 2009–a possible early sign of durable job growth. At the lower end of the size distribution, however, labor demand by small establishments has continued to be weak, with notably low rates of new hires. P.S. 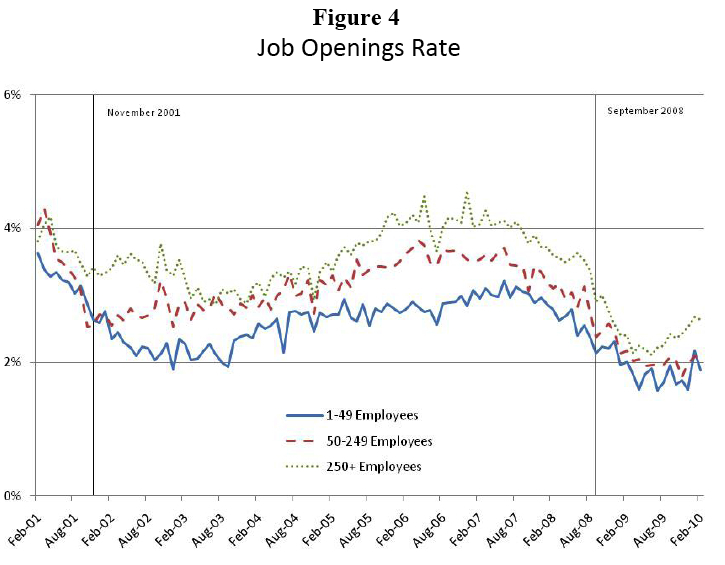 For an earlier discussion of the JOLTS data, see this post. I wonder if any of the issues small businesses are facing have to do with tremendous corporate influence on Washington policy. I’m growing very concerned about the marriage of corporation and state we’re seeing in our country – it seems that due to the lobbying resources enjoyed by many large corporations, regulatory barriers to productivity might be more detrimental for small versus large companies. Plus, even if the regulations and subsidies were equitably distributed, it would seem that a larger company, who has the benefit of economies of scale, is much more resilient when it comes to regulatory compliance costs. Perhaps we’re strangling our small businesses with regulatory, subsidy, and tax policy? on May 7, 2010 at 9:27 am Morning Bell: A Recovery Only Washington Could Love | The Foundry: Conservative Policy News. I don’t know what research says about recessions in general, but I would expect that small employers are generally “more elastic”: faster to hire and fire in response to recessions. Makes me wonder about what the appropriate trade-off for the economy is between flexibility (reallocating jobs quickly in response to needs) and stability (dampening the economic cycle by stabilizing employment levels instead of booming booms and busting busts).